We're running off from Nintendo's E3 2007 press conference to Sony's. Check back here shortly for our live coverage of the event. The conference is set to begin 11:30 PDT. 11:30AM PDT - Ok, we're seated, and things are getting started. 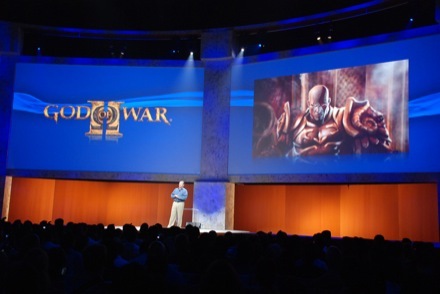 Swirling images on four massive displays, like the flowing background on the PS3. 11:32AM PDT - Opening promo movie coming up, kaleidoscopes of PS3 and PSP, but no gameplay. "Ladies and gentlemen, please welcome Mr. Jack Tretton." 11:33AM PDT - "We're extremely excited to unveil all our plans for the PS brand this year." Showing around Home. "We've already had our public beta going on for months, and this is the Home square." 11:36AM PDT - Jack's out, wishing he had his regular "death grip" on a podium. We "have a few other tricks up our sleeves, you'll be seeing games, games, and more games ... we're squeezing over 50 titles. Into this presentation." 11:41AM PDT - Showing PSP titles: Socom: US navy Seals tacitical strike, Wipeout Pulse, Syphon Filter: Logan's Shadow, NBA 08, God of War: Chains of Olympus, Silent Hill Origins, Patapon, tiger Woods PGA Tour 08, Sonic Rivals 2, SWAT: Target Libterty, Final Fanrtasy Tactics: War of the Lions,Castlevania: The Dracula X Chronicles -- "We're loving this 2D/3D look, and Castlevanis is one of the best looking examples to date." 11:44AM PDT - Hope you enjoyed that look at some of the great games coming out for PSP. In total there are more than 140 games coming to PSP in North America, when you match those games with other features in the PSP, you quickly understand why this handheld is truly unique. 11:45AM PDT - Jack is back in Home. "I thought I'd take the opportunity to pop back into Home to show you my tricked out apartment. I left the door open, so I hope some of the hot chicks will wander in." Kaz: "Do you mind staying here while I show off some things?" Jack: "No problem, I'll just chill here on the deck." 11:48AM PDT - "It can also output high quality video. You could hook it up to your Bravia HDTV, so everyone can only your PSP." Wow, video output. This is a truly killer feature, not only in terms of playing your PSP games at home but enjoying your UMDs (if you're into that sort of thing) on a normal screen. You see, this is a trailer for Spider-Man 2, which is out on Blu-ray from Sony Home Entertainment. So now, I press the display button, and as you see it's not playing on the flat screen behind me." The Spider-Man 2 trailer must be high-defish. Playback on a giant projection screen is impressive. This ain't no 480x272. 11:49AM PDT - "You can control what you're seeing, I'll pause it, get rid of the menu, etc. If you want the video back on your PSP, push the display button again and it's back on your PSP. 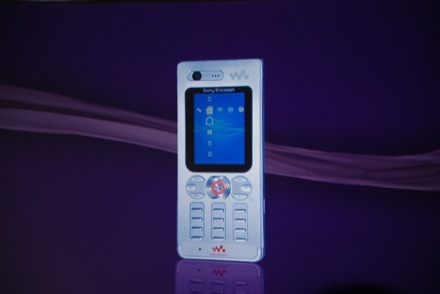 You can play games, videos, show photos, all of that on a tv screen or your PSP. With DLNA, you can also access the files on your PC at home via your PSP. This sparks the imagination, and encourages developers and players alike to think beyond the norm." We envision a bizarre future world where we stream computer video to the PS3 to the PSP over RemotePlay and then video output to a friend's HDTV. Sure, we'll only use this feature once ... but it's cool nevertheless. "As you can see it comes in piano black, but there are some additional colors that are coming to North America, which Jack will show off in a moment." 11:51AM PDT - Jack is back on stage, cracks some jokes (he's here all week folks! ), the crowd eats it up though. See, they're not so bad. "So, as Kaz mentioned, the PSP comes in piano black, but it also comes in Ice Silver. We plan to offer it in an entertainment pack, including a 1 gig card and Daxter. We're also offering the Family Guy Peter Griffin "Frickin' Sweet' edition. "We're also offering another color, and I've brought a special person to help introduce this color. Ladies and gentlemen, Chewbacca!" 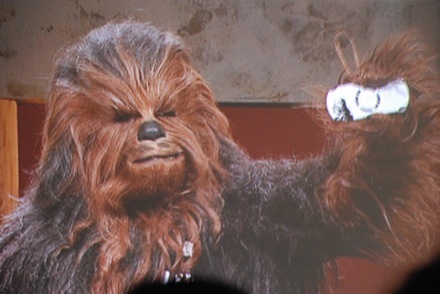 Chewbacca enters stage right to the score of star Wars. Wookie banter fills the auditorium. 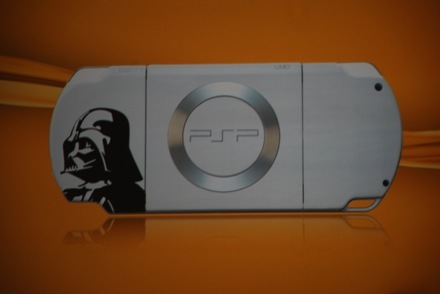 He's holding a Star Wars -themed PSP and promoting the Star Wars Battlefront pack, includes white PSP with Darth Vader's image on the back. Jack and Chewy go back and forth -- it's endearing. 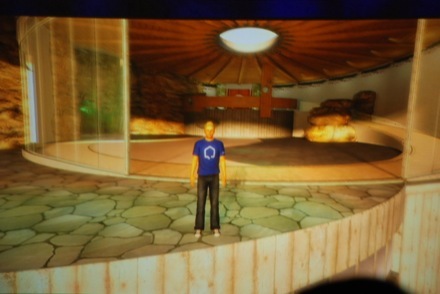 11:57AM PDT - Phil Harrison enters stage right. Naturally, he dwarfs Jack ... we wonder exactly how tall Phil is. "Thank you everyone. 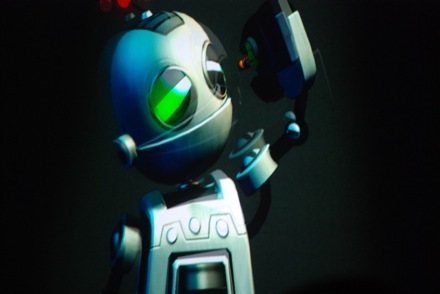 As Jack was pointing out, we have the ability to develop downloadable games that help drive the technology. For example, the PS3 has a huge hard drive, and that allows us to create the highest quality game experiences, just like you'd expect to see on a disc-based product. We have more than 80 1st-party games available for download and in development that will be available by the end of the year." 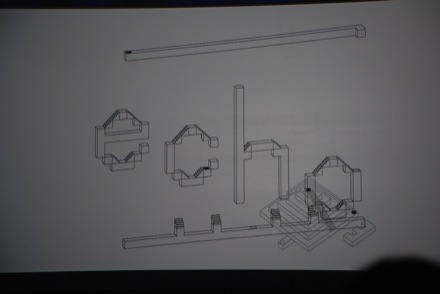 11:59AM PDT - "Every generation has a puzzle game that helps to define it, and today I'm introducing to you for the first time in the world, echochrome." Least graphics, most gameplay is their angle. An MC Escheresque world on screen with a stick figure man walking around. Think Jenga blocks plus stick figure man plus acid. The graphcs, while minimalistic, are really quite beautiful. They're crisp, clear, and dare we say elegant. The classical music gives the whole experience a real air of sophistication. Where's our smoking jacket? 12:01PM PDT - That's game #1, four more to go. "I have four more games I'd like to share, the 1st ... in eye-blistering 1080p and 60fps is Wipeout HD; the next one is Pain; the third is the online combat games par excellence, WarHawk; and Socom: US Navy Seals Confrontation. Let's take a look at them." 12:03PM PDT - Wipeout HD looks like ... well, Wipeout. But Pain on the other hand, this we can get used to. Maybe it's our sadistic side, but we'd really like fling that guy into a truck. 12:04PM PDT - Incognito's Dylan Jobe is on screen talking Warhawk. We're treated to plane, tank, and uh ... foot battles. "Warhawk is an incredibly fast-paced multiplayer game. You can play at home, or with your buddies online. It's incredibly immersive, yet at the same time, there's a huge war taking place all around you." 12:04PM PDT - Slant Six Games David Seymour talks Socom. 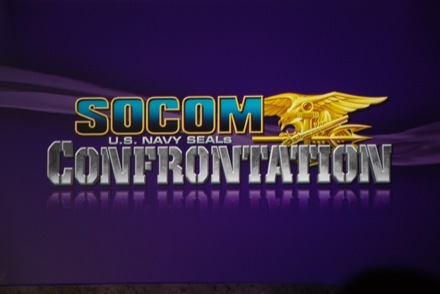 SOCOM Confrontation is Socom's first appearance on the next generation. The game is purchased online, and downloaded to your HD. As a result, the game runs purely off of your HD. It will be on Blu-ray and in the PS Store this holiday season." 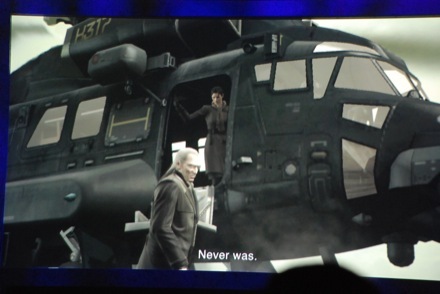 The game is purchased directly from PlayStation Store ... but also Blu-ray, not unlike Warhawk. 12:07PM PDT - "Now let's look at the new Home square that will be replacing the current Lounge lobby. This open air experience has more room for expansion over time. We'll be launching new spaces all the time for you to buy and customize, and add to your own space over time. Here I am in my new Space, a Norwegian ski lodge. Here inside, I've got a SingStar unit set up. It's the leading music game on the planet, with more than 10 million units and 300 million songs sold. It ships on Blu-ray, but is extended through the PSN and the Home experience." He's taking a group photograph. 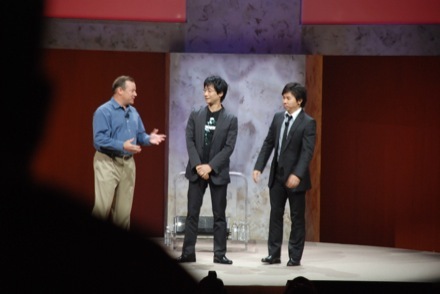 Fond memories of the GDC 2007 keynote flash back to us ... we were so young then and Phil wowed us with that Home demo. A new open air field is replacing the lounge area they'd previously showed off. The new space looks like a city square,. Think DisneyLand style new urbanism. Now a video montage of some of the new spaces. 12:10PM PDT - Singstar dev. "When you think about it, it's like iTunes meets MySpace." 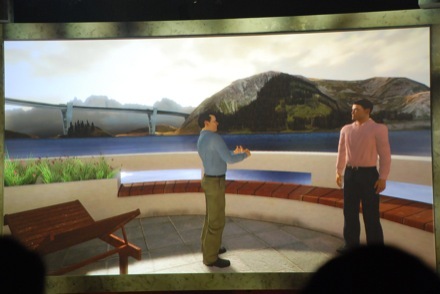 12:10PM PDT - Phil: "As you can see, these spaces are fully immersive living spaces. What?! Look! That photo I took from my phone is now online. Live media blogging from the virtual world to the real world!" The photo -- a not very attractive camera phone shot -- is already live on his wall in Home. It's a meta, live, blogging thing. Sorta like what we're doing here. But with more money. 12:11PM PDT - They're showing a social networking site for Home. This is like MySpace meets MySpace. "We can push content from Home out to a web browser, it's our social networking site for Home, which we're showing for the first time. It has live, automatic blogging from inside of Home. You can meet, socialize, talk about games ... and play games." 12:12PM PDT - "Here's a new feature, and that will be available when we launch in the Fall. You can jump into any game from inside the Home environment. Since I'm in the proper attire for Motorstorm, let's go for a race." : They just launched a game of MotorStorm, playing Eagle's Nest -- a new track available next month (let's hope there's no delays on this one). Phil's not using MotorStorm's nearly impossible to control Sixaxis controls. He stops the demo just as his pickup truck flies over a cliff Thelma and Louise style. 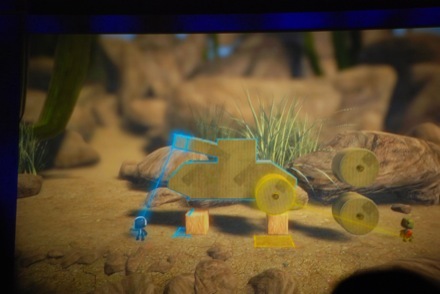 "It's not just multiplayer games that can be launched from Home, but any game. When you're done with the game, you simple quit the game and you're dropped back into Home. Publishers will be creating their own unique lounges for their games, it's not just limited to your personal apartment." 12:15PM PDT - Jack's back! 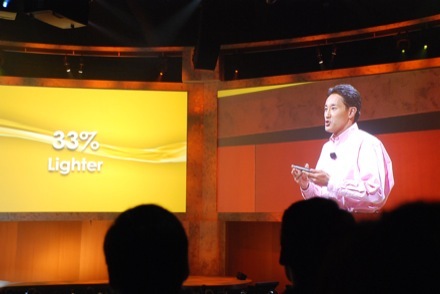 "The new PS3 went into effect on Monday, and our sales have doubled at our top five retailers. In fact, one of those retailers might have slipped the new price a bit early." (Laughter). That 80GB drive? It's for the online downloading enthusiast ... whoever they are. Jack cracks another joke that us bloggers just chew up -- one retailer was so excited they slipped their ad a little early. We love it Jack! Keep it coming. 12:18PM PDT - He's crunching numbers on the great HD-DVD versus Blu-ray wars of '06 and '07. We're totally convinced that Blu-ray was the right way to go, and the message is more than getting home to consumers. Blu-ray dvd discs are enjoying a sales figure of more than two to one over HD-DVD, including the Blu-ray drive in the PS3 helps make the console future-proof. 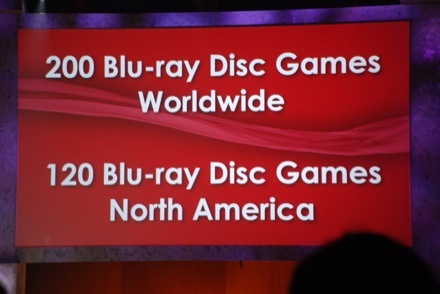 "There will be more than 200 Blu-ray disc games available worldwide, and over 80 PSN games." 12:18PM PDT - "Let's start with our partners games first. We're providing them with the tools they need to develop great games for the PS3. 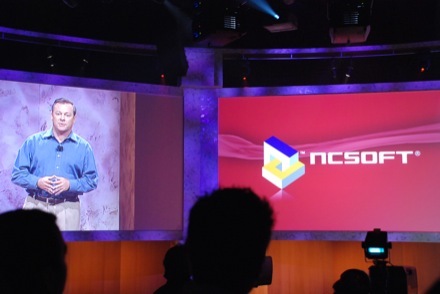 We're very pleased to announce that NCSoft will be joining the PlayStation camp. You probably know them from Lineage, City of Heroes, and Guild Wars. Very soon, they'll be brining that to the PS3 exclusively." Wow, Sony has managed to nab exclusivity to NCSoft's online games, based on current and new IPs. "Only the PSN can support the types of games NCSoft has become famous for." 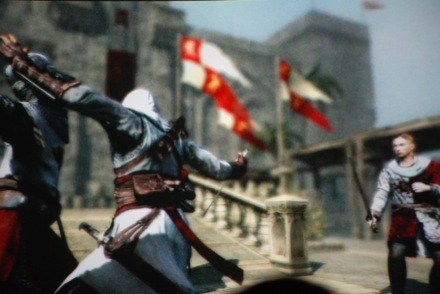 Are we gonna see Richard Garriot's Tabula Rasa on PS3 exclusively? 12:20PM PDT - "From a new addition, to a lifelong member .. Ubisoft. This fall they'll be bringing a new title to the PS3 .. Haze. Let's take a look..." Footage of Haze reveals some more details, including "playing dead." You're fighting the yellow-masked guys... "Today I am reborn, not it's time to set things right." Sounds like someone's gone renegade! 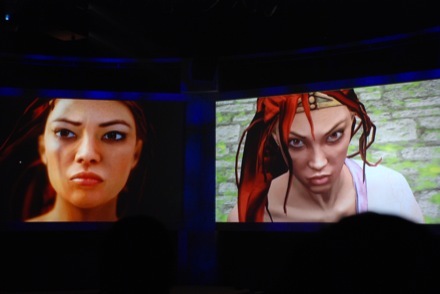 "That looks great, and it's very exciting to have Haze as a PS3 exclusive." If you want to play Haze this holiday, you'll need to do it on PlayStation 3 first. That answers that little exclusivity mystery. 12:24PM PDT - "The engine for this next game became one of the standards in the industry, and that game is Unreal. Sony has signed a multi-part agreement with Midway and Epic, and we're working closely with Epic to adjust the Unreal engine to the PS3 to use it to the best of its potential." First stage: working with Epic to optimize the Unreal engine for the PlayStation 3. 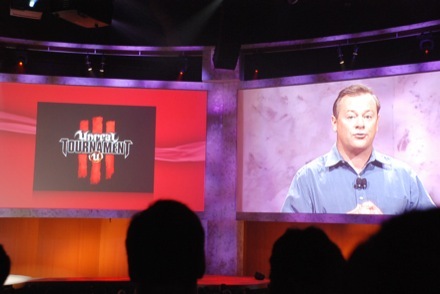 Unreal Tournament III confirmed as PS3 exclusive this year -- another timed exclusive. You'll also be able to share mods between the PC and PS3 platforms. Very, very cool. With Microsoft's announcements yesterday, and Sony's today, it sounds like Epic is probably looking for some more office space to store all their piles of cash. We've got some leftover office space here, fellas. Just call us. 12:26PM PDT - Videos of more games: Like Microsoft last night, Sony is showing off Call of Duty 4: Modern Warfare and Assassin's Creed (we love that Unkle trailer. Seriously, just play it one more time for us Sony). Also, like Microsoft (but a little more in depth) a look at Kane and Lynch Dead Men, a game we're still pretty in the dark about. Again, just like Microsoft, we've got Resident Evil 5. This is like going to a party, seeing that other person you hate, and finding that you're wearing the same outfit. Oh, the shame! We've also got brief looks at Burnout 5 Paradise, Madden NFL 08, Harry Potter and the Order of the Phoenix: The Videogame, The Simpsons Game (we're seriously hearting the cel-shaded graphics), Guitar Hero III: Legends of Rock, Medal of Honor: Airborne and Rock Band ... Jack has to force the crowd to applaud. 12:33PM PDT - "There's one last third party exclusive I'd like to share ... this franchise has been a fixture on our consoles since the beginning, and it's only on PlayStation 3. Ladies and gentlemen, Hideo Kojima." 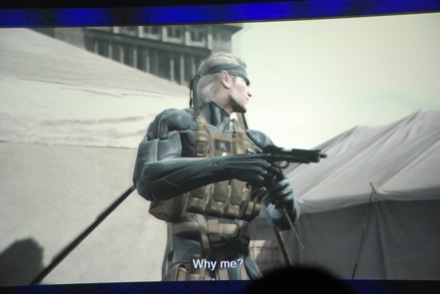 Hideo Kojima takes the stage. 12:33PM PDT - "Hello everyone. I safely made it, again, to this E3. Well, the game Metal Gear, known as a stealth game, is celebrating it's 20th anniversary come July). Well, I've been creating this metal Gear franchise for over 20 years, over many platforms, and this MGS4 will be the final part of the series. The story of Snake will end with this one and me, as a game creator, this will be my last to end with this series. So, all the story plot, the characters, the mysteries, will be revealed. 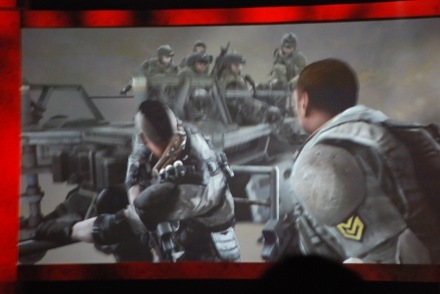 And the game itself will be a stealth game, with new elements of the battlefield. I promise you I'm putting all my effort, all my skills..."
12:36PM PDT - They're going to show off the new trailer they promised -- the first with English dialog. Oh Snake, you sound so old. We'll always say we knew you when. Everything's in game ... and it looks incredible. We don't know how you do it Kojima-san, but you never cease to impress us. 12:37PM PDT - His job: kill the new mustachioed Liquid. Again. 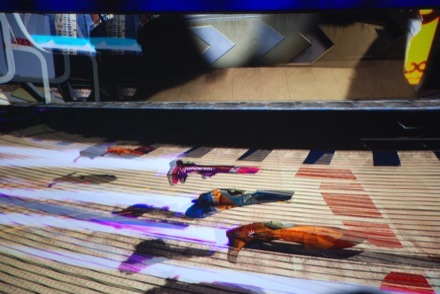 Soldiers flail on teh ground, suffering from the effects of Foxdie. Whoa ... an epic battle between the new (and totally badass) Raiden and a long haired gentleman. We can barely pull our eyes away, but we still would have loved to see some actual gameplay. Video finishes with "Simultaneous Worldwide Release." Kojima asks, "How was it?" The crowd claps approvingly. 12:42PM PDT - "Sorry, this time because of time we only have the traiiler, but in Tokyo we will have a demo, playable. I hope everyone can come to Tokyo next week. See you in Tokyo, thank you." Sure, Kojima-san. We'll be there. With bells on. 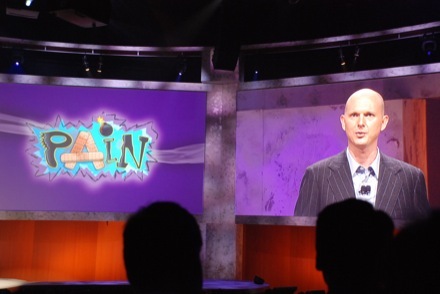 12:44PM PDT - Phil's back on stage, Home is behind him with Phil's avatar wearing a giant Ratchet suit. We'd give almost anything to see the real Phil in this outfit. Showing Ratchet and Clank; then he walks through the space to a Folklore setup, and they start a Folklore trailer. 12:47PM PDT - Next on the list, we see a special theater for Heavenly Sword. 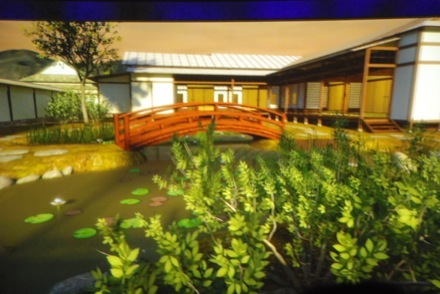 "We've built a special theater in Home for Heavenly Sword, here's a look at it." A series of steps lead up to the screen, and the video starts. Each of these videos features a voiceover by one of the game's designers. Sony seems really intent on tying the development studios name, and the designers, to each of these titles. 12:55PM PDT - Pleased to announce a new game from Suckerpunch, the Sly Cooper developers. 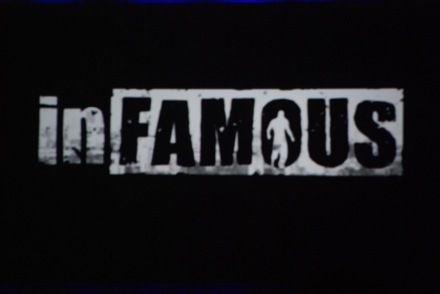 It's a sandbox game, where you choose the path between superhero and antihero: Infamous. This appears to be in engine, and it looks very impressive. With the character climbing walls, using superpowers, we're thinking Crackdown meets Assassin's Creed meets Grand Theft Auto meets City of Heroes meets other stuff. Color us impressed. 12:57PM PDT - "Of course, it wouldn't be a PlayStation event without including the most successful racing series of all time, Gran Turismo. 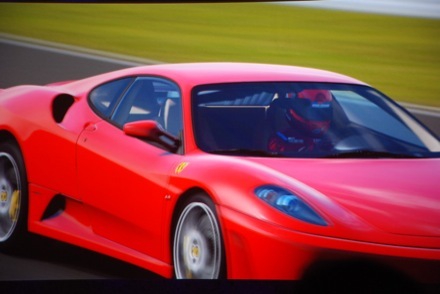 We'll be bringing Gran Turismo 5: Prologue to the marketplace as a precursor to Gran Turismo 5." We're not sure what to say here. It looks like Gran Turismo, beautiful as ever. We'll see how the whole "prologue" thing works out. 12:58PM PDT - Jack's back on stage. "Phil, didn't you forget one thing?" Phil: "Oh yes, everything you're about to see if real time." ... The Killzone 2 trailer! 1:02PM PDT - Man, we can't tell what anyone is saying in the game! It's all yelling and gunfire. (Looks great though). This is the same Killzone presentation we saw last night, with a developer on stage playing though the level just like they did last night. 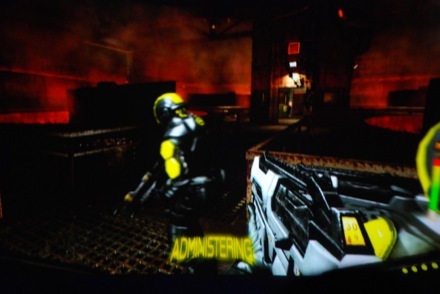 The two middle screens show the playthrough, while the two side screens show pre-recorded footage of later parts of this level. We don't think they're going to go through the entire 20 or so minute thing for us. 1:03PM PDT - That's it! The audience claps, and there's some hootin' and hollerin'. "Again, thank you very much for giving us the opportunity to show what our international studios are capable of." The doors to the arcade are open, and everyone considers whether they really have to leave or not.